The Genetic Choir teams up again with the writer’s collective De Vorlesebühne to present an evening of prose and music at Molen De Ster in Utrecht on Saturday 17 March. An evening of vocal absurdity not to be missed! You can dine together with the performers from 18:15 inside a historic windmill. Jolanda’s Kitchen prepares a delicious and nutritious three-course menu. 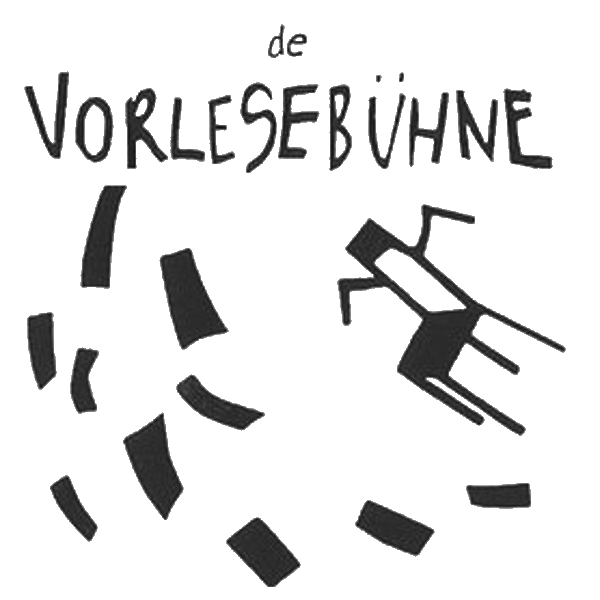 Reservation via vorlesebuhne@gmail.com is mandatory, at the latest on Thursday 15th March. Entrance to the windmill via bridge Floresstraat. Wonderful 2 day festival in Hiroshima! The hall was always filled with good atmosphere that made participants positive and creative. I had lots of precious experiences during the festival. All events in the program, including Genetic Choir’s performances, workshops, a lecture, a symposium, and a concert were really impressive and meaningful to me. 1. First of all, I was deeply moved by the opening performance by Genetic Choir (GC). It was exciting experience for me to witness the genesis of sounds and music. 2. Two workshops by Mr. Thomas Johannsen (the leader of GC) were really joyful and meaningful. I learned a lot not only from Thomas but also from other participants. It was most impressive to me that I felt silence as substantial when all of us closed our eyes, kept long tones, and listened to the silence in the wave of sound. I was excited to feel that the silence had a color, weight, texture, and density. 3. It was also wonderful experience for me to take part in the “Stage” workshop navigated by Mr. Daisuke Terauchi. It’s a really splendid idea to “do anything you want to do!” It was interesting to see that there was a harmony on the stage while each participant did what he/she wanted to do. I found it joyful to watch people doing what they want to do. 4. In the symposium, I was impressed with some ideas, especially ones shared between Thomas and Kristien. Thomas said that GC tries to accept everyone who wants to take part in the choir. (I’m not sure if GC welcomes everyone as its member. Maybe he just referred to the case in GC’s workshops.) Kristien added that when she finds it uncomfortable to sing along with a newcomer, it is a good opportunity to search for a new way to make the choir more interesting. Thomas and Kristien share the idea that they can and should learn from newcomers and even from beginners. Even when it seems that a newcomer is not good at singing, they try to find something special in his/her singing. I think that GC regards diversity, individuality, and relationship among people as the most important elements of creativity. 5. In concert, the last event of CMF2016, all the participants performed on the stage, sometimes with the members of GC. Most participants bravely tried to do what they had never done. Everybody on the stage was really beautiful because of the big challenge. It was amazing experience for me to perform with GC and other participants. Ralph, Tanaquil, Thomas, Monica, and I improvised a children’s song. I was so happy that I saw everything in the hall was shining. The closing performance by GC was also wonderful. The members invited the audience onto the stage during the performance. We all were free to sing, to shout, to chant, to dance, and to chat, but there was a harmony on the stage: a harmony that originates in disharmony. It was touching to me that the light on the stage and the darkness on the seats for the audience overlapped with each other and created beautiful scenery. The Genetic Choir Ensemble is right now boarding their plane on Tokyo Narita Airport on their way back to Amsterdam. What an amazing days it have been! You can find the on-the-go photo diary of our tour and performances via the link below. More detailed reports will follow! In what may be the most unlikely artistic collaboration of this year, the Genetic Choir will create new music for the piece “Born on this Planet” by Bunraku company Mokugu-sha on 22nd and 25th of September in Tokushima, Japan. 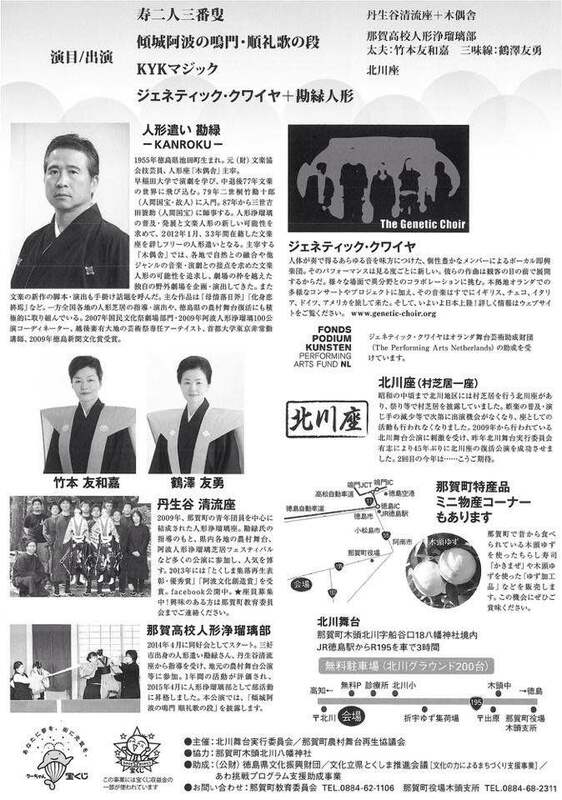 After giving vocal workshops and concerts coming weekend in Hiroshima (see here), the Genetic Choir Ensemble will travel to Tokushima province where they will meet with master puppeteer Kanroku, who is one of the most prominent performers and teachers of this ancient puppeteer tradition. 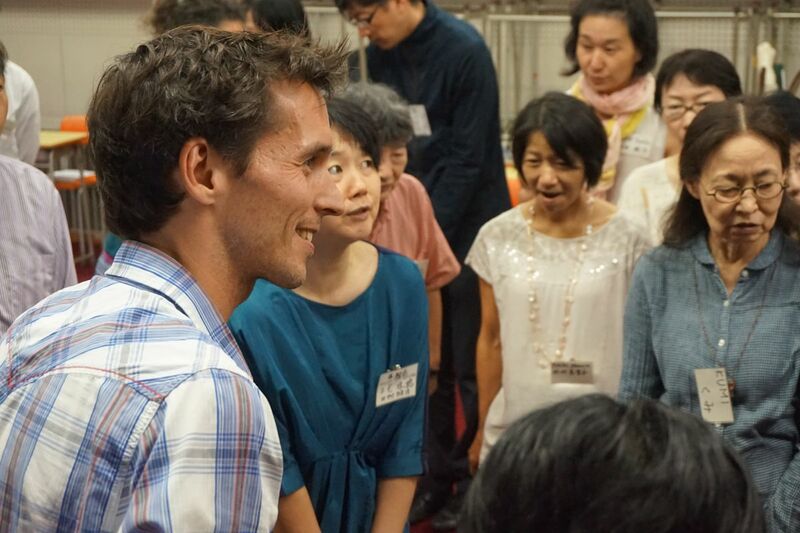 For a new play that he created in the wake of the Fukushima nuclear disaster (“Born on this planet”), he asked the Genetic Choir to create new all-vocal music, which will be premiered on the 22nd and 25th of September in Japan. 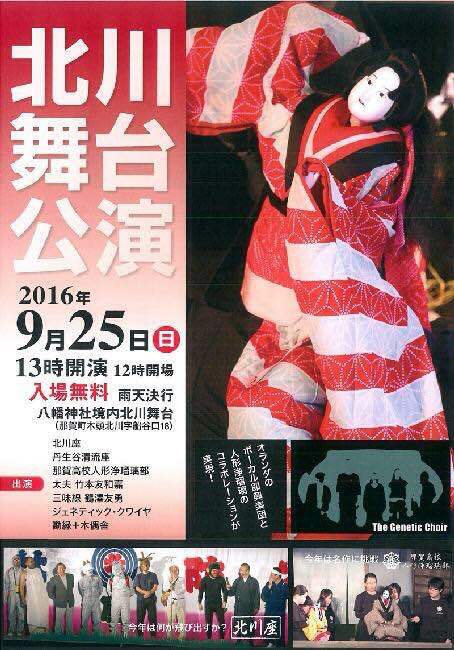 First in Tokushima city, and the second performance in one of the ancient village puppet theatres (Kitagawa Nouson Butai ), up in the mountains of Tokushima province.